ridicully | I can't really title ever single entry "I aten't dead"
I can't really title ever single entry "I aten't dead"
This, amazingly enough, has nothing to do with climbing or the Tough Mudder I ran last month. I simply stepped in a pothole on the street. Pure stupidity. It doesn't even hurt any more. Just ... is swollen and purple-green. I'm not someone to make sensible health decisions, so I went climbing on it once already. Which I shouldn't do but I have way too much energy and no way to get rid of it. Problem is, swollen as it is, it doesn't squeeze properly into climbing shoes. Also, my california trip which involves lots of hiking is less than a month away. I *should* be sensible. It's something I do so well. Exhibit A - The Ridi shaped mud monster on the right. Yes, maybe sensible decision making is better left for someone else. 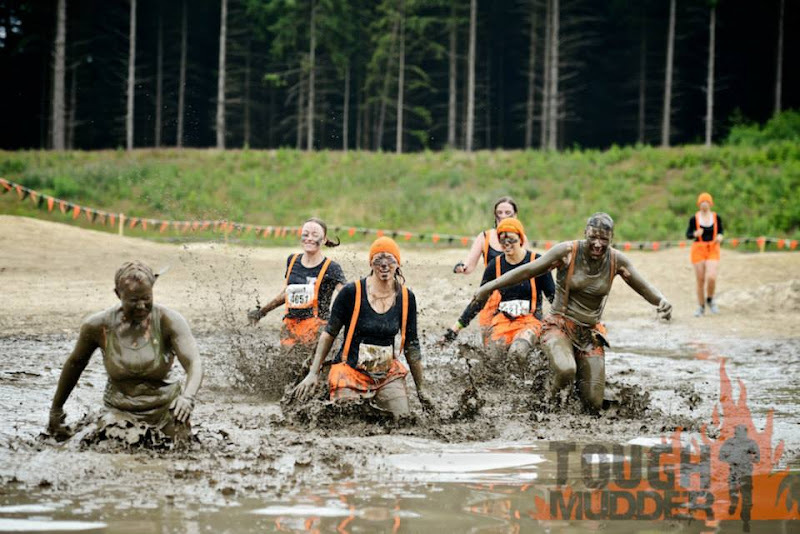 Please note the lovely orange hats on the rest of my team. This is what I've been doing when I'm bored at the moment. Knitting hats. Hmm. Coherent, this entry is not. But it's got pictures and will maybe break through the barrier of "Too much stuff, can't post before I have talked about all this". Once I fell down a short (like, five step) staircase because I was reading a book. Here's hoping it's less heinous by hiking time. Yup, being special when damaging yourself. Sounds perfectly normal to me. And it will be better. If not, it'll get strapped into the hiking boots and walked on anyway. Potholes are really dangerous! 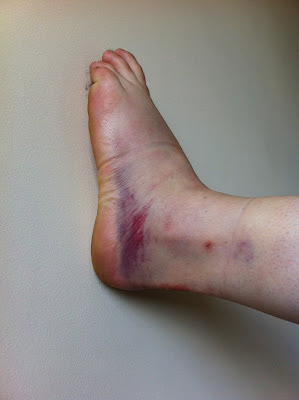 Hubby once stepped into one and went over his ankle and then his foot looked exactly like yours. I'm crossing my fingers it'll be good again when you'll go on your hike! 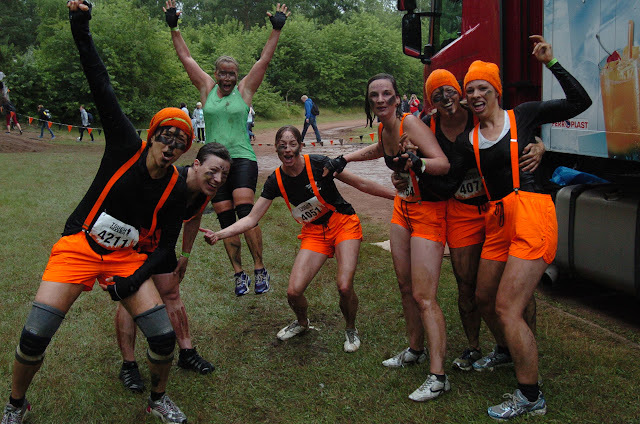 The mud race was so much fun! And potholes are a menace. They always take you by surprise and that's what messes you up. I meant to ask you on facebook, but, well, then didn't. And now I remembered. Was the "ΓΝΩΘ..." I saw on your arm "ΓΝΩΘΙΣ ΕΑΥΤΟΝ"? Google translate has only half a clue, so I'm guessing it's "know thyself"? Supposedly, yes. The common transliteration is "Gnothi seauton". That race looks like heaps of fun! Are you toproping? You could go for one-legged climbing and pick easier routes to balance it out. I tried it once or twice... it's still fun. It's interesting. The race was great! My whole team pretty much ganged up on me to make sure we're going to do another one next year. D: D: D: to the foot. Yikes! 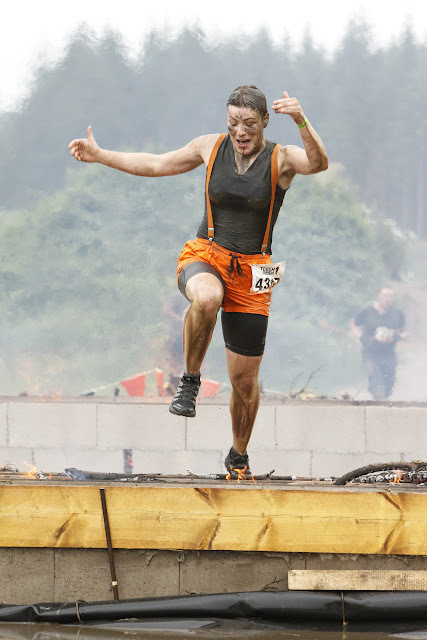 The Tough Mudder pics are awesome. You all look great!